— I hate to change the subject all of a sudden, but the second half of the show takes quite the dramatic turn with the introduction of Mishiro. Would you mind if I asked what lead to the decision to bring in a completely new character like her? Takao: That’s another decision where my experience with Animas came into play. Chances are we could have stuck with what we did up until episode 13 and things would’ve been fine, but I felt it was necessary to introduce one final challenge for the girls to help them develop even further. What’s more, said challenge wouldn’t present itself as an outside factor like Kuroi did in Animas, but as a part of the very production they work for. Granted, that ended up making things more difficult for me in the long run. Takao: Well, it was important to ensure that Mishiro’s portrayal never reflected upon 346Pro as a whole. I needed the viewers to understand where she was coming from in terms of her stance on where the company should go, but also that said stance can seem selfish from Cinderella Project’s standpoint. Her character actually developed further and further in my head as I worked her into each episode, so up until episode 17 or so I’d simply portrayed her as a woman with nothing but her company’s best interests in mind. The truth is that, amidst it all, she had one other dream of her own. She was the story’s final Cinderella. — Ohh, so that’s what you were going for! Takao: Her design’s reminiscent of your typical witch, but what I was actually going for was something more along the lines of a person who has very set beliefs on who is and who isn’t worthy of her castle. With the twist being that she was just another Cinderella amongst the rest of them, of course. The way she forms and handles Project:Krone — handpicking those with raw talent and ability, deciding on their direction herself, then sending them out in peak condition — matches that image perfectly, but it’s important to note that she isn’t wrong in doing so, because there really is no “right” way to go about it. — And that’s why the Producer never once tells her as such, opting to value both her own methods and the variety they brought to the table. Takao: Someone actually brought up the idea of the Producer simply leaving 346Pro and taking Cinderella Project with him, but that’s not a path I ever wanted to go down. I mean, what would the other 100 or so girls left behind do if that were to happen? What if that ended up having serious consequences for the company itself? Not to mention the fact that I wasn’t fond of having him deny another person’s approach as a means to prove that his own one works; I wanted the struggle to be all about proving that Cinderella Project’s heading in the right direction without directly attacking Mishiro’s ideals. — The second cour certainly tackles some difficult themes when you take that into consideration. Takao: Another thing about Dereani is that it’s about a group of girls simply coming together and getting to know others. The individual units may initially be comprised of people that aren’t particularly close, but the gap between them closes the more they work together, which in turn leads to an eventual blur in the distinction between said individual units and the group as a whole. Basically, I wanted another aspect of the story to be about how expanding your group of friends is always a good thing. To that effect, everything up until episode 13 was about how nice it is just to be with the people you’ve established a connection with, and the story after that’s about how said connection won’t be broken even if circumstances force you apart. In fact, taking advantage of that to establish new connections and expand the group as a result only makes life nicer for everyone involved; that’s the ideal world I had in mind for Dereani. Granted, I’m pretty sure I did a poor job of getting that across in the show itself, haha. Nishigori: On the subject of “villains,” I went the extra mile to make sure Kuroi didn’t feel realistic. There’s probably a better way to put it, but I’d liken him to a cartoon villain more than anything else, because his own circumstances don’t really mean much in the end. Even if he were a good guy all along, it doesn’t change the fact that everything he did was irredeemable. There were two reasons I ran with that idea, too: one was because it’d just make life easier, and the other was that I was worried about spending too much time on him and having that impact the other characters. Thinking back though, that’s a decision I regret quite a bit, especially when Takao dove right into perilous territory and worked to develop Mishiro just as much as the other characters. Takao: There’s quite a contrast between her positions at the beginning and end of the second cour, haha. Nishigori: Either way, the line between right and wrong gets blurred significantly when you handle characters the way Takao does. Even worse, you can’t really avoid delving into and explaining their reasoning, otherwise you’ll leave the viewers less than satisfied. Knowing what she’s like though, I get why she felt the need to do so; in fact, it’s exactly what I wanted to see from the show. Nishigori: The way I dealt with realism in Animas is actually one of the reasons I started feeling frustrated with myself when looking back on it. Takao was talking about how imas has that compassion and kindness at its core earlier, and that’s something I definitely agree with. It’s one of the main reasons I came to love the franchise as much as I do, so I really wanted to get that across within the show itself. At the same time though, the last thing I wanted was for it to come off like I was pandering to an audience who just wanted cute things and the like, which is one of the reasons stuff like Chihaya’s episode and the final arc were included; so I could cheat my way into making it feel realistic. The movie’s events were shaped through that mindset as well, and at the time I honestly felt like I’d pulled everything off perfectly. — So you gave it your all and were satisfied at the time, then. Nishigori: It turns out that what I’d done was largely superficial in the end though, so I really wanted Takao to get the job done properly this time around. She’s far more adept at characterisation than I could ever dream of being, so hopes were high that she’d ingrain some good realism into both the story and the characters themselves, and lo and behold, she did just that. 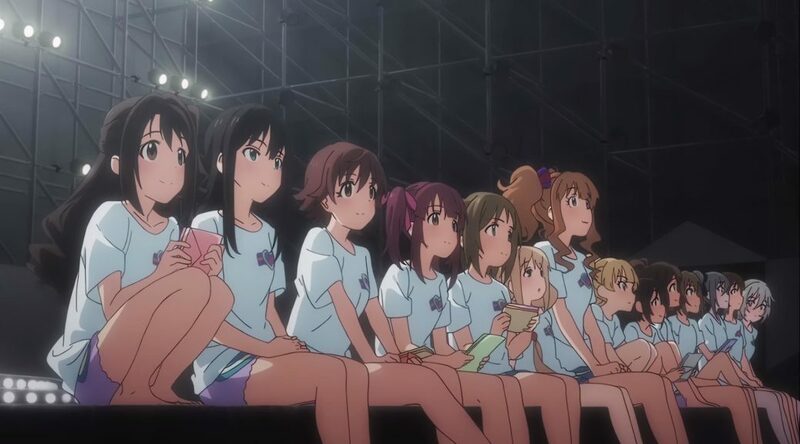 It’s pretty obvious just how skillfully she pulled it off too based on how the girls act around each other, and even more so whenever we see them just before a live’s about to begin. I felt she did an especially good job with Mishiro as well, and listening to what she had to say about her just there only helps to confirm that. I mean, there’s probably people who wanted to see her “defeated” in a sense, but that just feels like it would have ruined everything the show had been building up to. — Right then, let’s round this off by asking which episode stuck with you the most. Nishigori: Takao’ll probably give you a proper answer to that, so I’ll just take this chance to say that I loved episode 13. That scene at the end — where they’re all looking up at the night sky after the live’s over and done with — stood out for me especially, and not just because of how well drawn the legs were, haha. Stuff like the way Shiburin gets on her tiptoes briefly while talking to the Producer makes it apparent that both her and the rest of Cinderella Project really did just have an amazing time there, which is especially rewarding when most anime have a habit of denying you that feeling of satisfaction at the end, haha. — That scene actually felt reminiscent of the Animas movie for me, namely the bit where they’re all watching the sunset together. 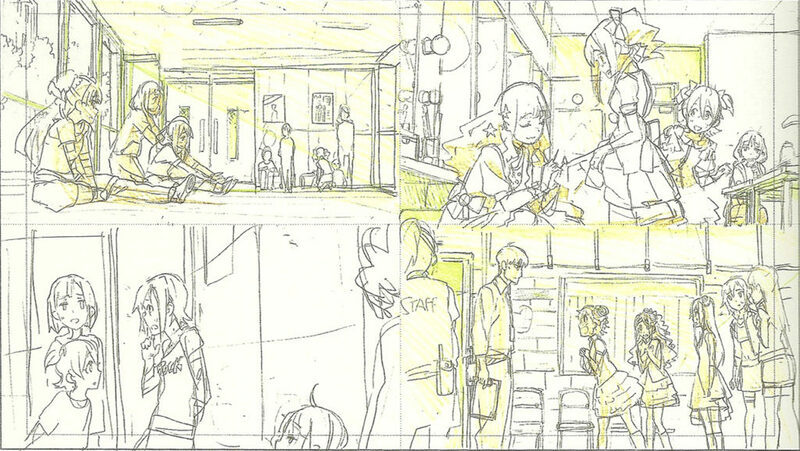 Nishigori: Now that you mention it, both scenes might have been going for the same effect. Takao: Oh, that’s a fair point. Nishigori: It’s kind of similar to when you finish up that last bit of work and know you can just sit back without anything on your mind. Moments like that really are special, though in this industry it’s pretty common to find yourself getting super worried not long after, haha. Takao: As for which episode stuck with me the most… Part of me wants to say episode 1, while another part wants to say episode 7, haha. Sorry for being so indecisive. Takao: It might actually be the very last part of episode 25, when I think about it. The bit where they introduce themselves as Cinderella Girls, specifically. Having them go up on the same stage and wear the same outfits as the idols they simply admired during episode 1’s opening was done as a means to represent what they’d come to learn along the way; they never would have made it that far if it weren’t for the things and the people they got to know throughout the story. What’s more, it also represents the endless possibilities for both them and those who could possibly come to look up to them. Hopefully the viewers understood my intent while watching that part. Oh, it’s also worth pointing out the lack of any “Fin” or the like at the end. That was me implying that their story’s just begun. — The finale did make you feel like it was just one part of a bigger story. 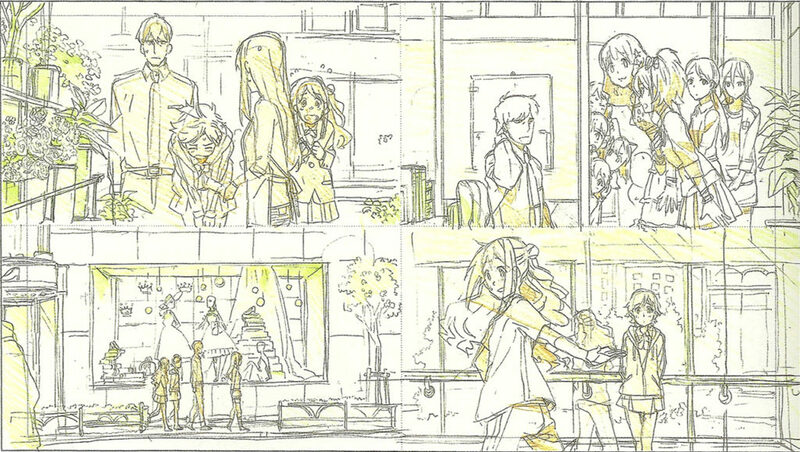 Takao: Suzuki (Kentaro) was in charge of storyboarding the first half of that episode, while I handled the second half. There’s a sequence towards the start of the episode that shows episode 1’s intro as if someone were flipping through a picture book, which caught my eye as I was checking through Suzuki’s boards. That’s actually what inspired me to include the book eventually flipping to a blank page at the end of the episode, and it’s thanks to that we managed to tie in the Cinderella motif as well as we did, I’d say. Of course, there were a number of other things I wanted to do with the story, and characters whom I wanted to incorporate into it, but couldn’t in the end. Nishigori: Even then, you still managed to nail all the important stuff with it. You even got the obligatory variety show episode in. Takao: I actually love episode 9 a fair bit, haha. Having the opportunity to make an episode like that in a TV series honestly felt like a blessing, enough so that most of my time checking the storyboards and attending the recording sessions for it were spent wondering if we should really be allowed to go through with it. Even better is we had Masunari (Kouji) boarding it, who has a knack for serving up a perfect display of cute girls doing cute things without it feeling too forced. Nishigori: Looks like you had an easy pick for your favourite episode after all, haha. And that’s a wrap! But don’t unfasten those seatbelts just yet, because we’ve still got a number of interviews to come over the next month; expect to see those every Friday/Saturday, unless I somehow break my fingers from excessive translating. Once again, if you’re interested in picking the fanbook up, you can do so here. Thanks you for the translation! There are still a lot of interesting interviews on the fanbook,so I hope to see more. Worry not, there’s plenty more to come! I can not wait to keep reading.